Parasites such as mosquitoes, ticks, and the organisms they transmit when they bite cause disease without discriminating between people and pets. All are fair game. And then there's the threat to the food supply. The National Center for Veterinary Parasitology has been keeping people and pets safe, and ensuring farmers and ranchers can keep their products free of parasites and safe for consumption. It's a unique collaborative project between the private sector and academia, existing within the halls of OSU's Center for Veterinary Health Sciences. Launched in 2009 with financial commitments from key industry sponsors and a foundation grant, this year marks the center's fifth anniversary. "The support of the Kirkpatrick Foundation, Novartis Animal Health, Bayer Animal Health and Merial allowed us to establish the center and then nurture it in the early years," says OSU Regents Professor Dr. Susan Little, the Krull-Ewing Chair in Veterinary Parasitology and co-director of the NCVP. "The concept was novel — to create a clearing house for all things related to veterinary parasitology, support clinical parasitology research and develop the next generation of veterinary parasitologists." In 2014, animal-health companies Merck, Zoetis and Elanco joined the other sponsors to support the NCVP. For each sponsor's annual donation of $100,000, a resident position is established in the company's name. The NCVP also sponsors two additional residents. 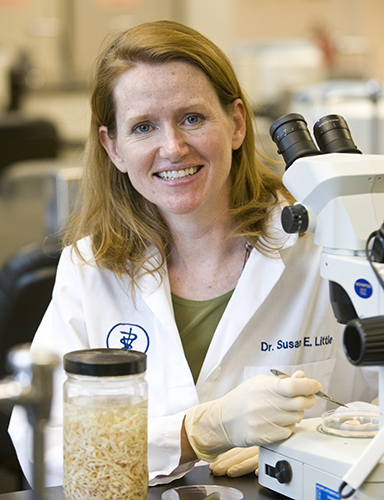 Several residents have received national awards for their research. The number of applicants from across the U.S. continues to grow, with top-notch veterinarians joining the NCVP team. "Before the NCVP, there was no pipeline for future talent specific to veterinary parasitology," Little says. "The need for veterinary parasitologists has grown but with a limited supply. Both academia and the pharmaceutical industry need well-trained clinical researchers to effectively combat parasitic and vector-borne diseases." Sound clinical parasitology training leads to better understanding of real-world application and needs. A perfect example of parasitology helping veterinarians practice better medicine is how NCVP research improved heartworm diagnoses. "Because of research conducted at the NCVP, we now know that many infected dogs, and perhaps most infected cats, may not test positive even though they have worms," Little says. "Fortunately, this research also identified a simple, in-clinic modification to how the test is run to address the problem." On the center's website, ncvetp.org, teachers can access a free database with hundreds of parasite images. Other teaching resources include a "case of the month" and a Jeopardy!-style parasitology review game. The center's diagnostic arm continues to become more active, says Dr. Eileen Johnson, an associate clinical professor and the NCVP's diagnostic veterinary parasitologist. 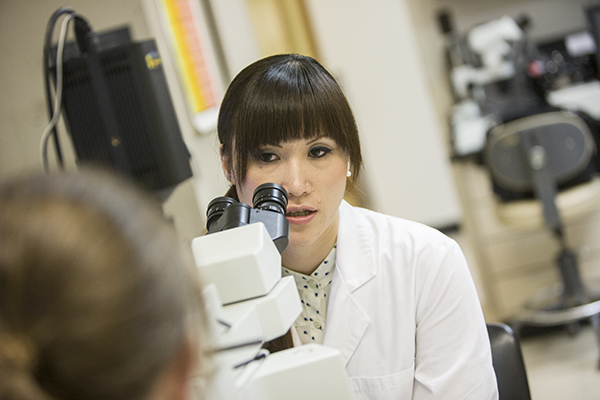 Yoko Nagamori, a veterinary parasitology resident, examines specimens under a microscope at the National Center for Veterinary Parasitology. "The diagnostic lab processes hundreds of samples each month for veterinarians in practice and for other reference labs," Johnson says. "Most of the samples are from small animals, many from shelter animals. Some of the most common findings include hookworms, which can cause severe anemia in young animals, as well as coccidia, Giardia, roundworms and whipworms, which can cause diarrhea. Many of these parasites are zoonotic, and can cause disease in people that become infected, so identifying and treating the infections are particularly important." The clinical parasitology lab also collects materials for courses at OSU and other veterinary colleges, and Johnson teaches best practices in diagnostic parasitology for residents and graduate students. "The NCVP provides information to veterinarians to help them recognize parasites in the animals they treat," Little says. "An accurate, early diagnosis can cut down on the cost of treatment for the owner and hopefully bring the pet back to a healthy state faster." The newest addition to the center is the small-grants program, which funds one-year projects to address specific problems in veterinary parasitology. "For the first time, the NCVP was able to award five grants totaling more than $40,000," Little says. "Student involvement in the project is required, which gives us one more opportunity to get younger scientists involved in and excited about parasitology research."